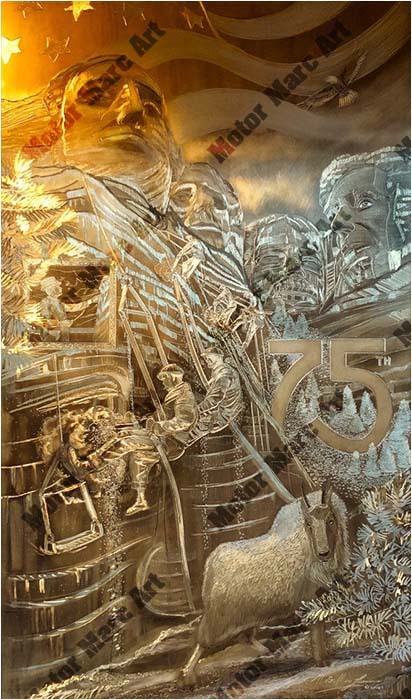 Motor Marc Art has created this piece of original iron art, entitled Monumental Pride, to commemorate the 75th anniversary of the completion of Mount Rushmore. Marc is gifting it to be part of this online auction from August 7 to October 1 to support the activities of the Mount Rushmore Society and highlight the artistic nature and significance of Mount Rushmore National Memorial. 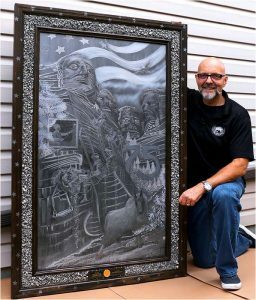 Original art size is 28.5″ x 48″ plus the outer frame, which will incorporate granite leftover from the redevelopment of Mount Rushmore. For more information go to Mount Rushmore Society Auction Page. Please contact Debbie at 605-341-8883 or debbie@mtrushmore.org if you have questions about the process. Happy Bidding, and thank you for supporting the Mount Rushmore Society and our mission! !